As professionals, you have the tools to assess whether or not a prospect is a good risk for buying your product: you know the type of problem best suited to your product and the signs of ‘need’; you ask good questions, analyze needs with a keen eye and ear; create presentations or professional pitches; and manage objections to ensure understanding and product differentiation. So why do you close only a small percentage of the business you recognize as yours? Going against the beliefs of the sales model, buyers don’t buy because they have a need or an Identified Problem (that visible tip of the iceberg that we sometimes call ‘pain’, different from the hidden pool of historic problems that created and maintain it). Buyers buy because they have a business problem that needs to be resolved BEFORE being in a position to fix it. Indeed, the Identified Problem is merely the visible part of the prospect’s entire range of issues that comprise their problem. And although your solution is seemingly a perfect fit, it will most probably not manage the business problem that created the Identified Problem to begin with, even if the prospect placed the call to you: it’s most likely far too early in the buyer’s decision process. WHAT IS A BUSINESS PROBLEM? A business problem arises when the system that prospects live within makes a change in their rules or policies, relationships or initiatives, and in the process creates that ‘pain’ that your product most probably can resolve. In fact, the point at which the prospect actually decides to solve their Identified Problem usually has no relation to when or how you meet them, or how ‘urgent’ their need seems to be. They might just be beginning their search, be caught in a quagmire of internal stuff (and has nothing to do with you), be absolutely ready to buy NOW (hence those sales that happen in record time), or really not even sure they are going to take any action at all. It’s even likely that the prospect’s Identified Problem has been around for some time and has become so ingrained in the company story that change is not an option no matter how well your product can help them. The prospect’s Identified Problem is merely the tip of the iceberg of the full range of issues that would need to be rectified before a decision to fix it gets made. A prospect’s problem is much bigger than what you can see or your product can manage, and therein lies the dilemma: the piece you can fix is merely one aspect of a set of problems that need resolution. In other words, before they can resolve the part that’s yours to fix, they have other work to do. And sales won’t help you help them. When you ask questions, gather data, or do needs assessments, you are merely attempting to understand or resolve the tip of the iceberg that seems to be an obvious match with your product. But the standard sales competencies do nothing – nothing – to manage the issues that have been happily holding the problem in place: ‘happily’ because if the problem were as much of a problem that we think it is, it would have been resolved already. The buyer-seller gap is really a systems problem, brought about by the imbalance caused by the possibility of change that the buyer is facing. The most important thing to understand here is that no action will take place, no matter how urgent the apparent need, until the buyer figures out how to handle each of the people, policy, or political issues that conspired to create the entire problem to begin with. And every Identified Problem has a string of systems issues behind it: no Identified Problem is an isolated event. Here’s a simple example: when I moved to Taos, NM – a mountain town known for its heavy snows - I desperately needed a new car. My new house was on a road that was not paved, and because of the centuries of snow and ice and mud, an SUV was vital. But because it was winter and the ground frozen, I couldn’t build the garage I needed to protect the car. I also had to wait until my favorite builder came back from his Mexican winter break. So I couldn’t purchase a car until the spring. Needing a car was my Identified Problem – that tip of the iceberg that was what sellers would have seen if I had been going to car dealerships. But no matter how hard anyone could pitch me on an SUV, there was no decision I could make until the other issues got resolved – the weather, the builder, and the garage. And, the weather was both the creator and maintainer of the Identified Problem. The buyer-seller gap is created by the buyer and seller operating out of two different sets of assumptions: the buying decision assumes the need to manage the internal issues that are creating a problem; sales assumes the need to solve a problem with a specific product. Sales is a solutions-based model: Understand needs. Fix the pain. Solve the problem. But the buyer would have already handled this if they knew how to resolve the underlying issues that need to be managed. Like my car example, if I could have built a garage – that I couldn’t build because of the weather - I would have bought my car – that I needed because of the weather. Buyers merely seek a resolution to a business problem and must take into account the people, policies, rules, and initiatives that created the underlying problem that created the Identified Problem. It is up for discussion whether, when, how, or if the actual Identified Problem itself will end up being solved along the way. Until buyers figure out the dimensions of the underlying problem – how it manifests itself daily, who it’s touching and how, what it needs to look and act like over time, and what levels of responsibility each part must take to ensure a solution and manage the ensuing change – they can’t know what actions need to be taken to fix it. Indeed, if solving the Identified Problem creates so much disruption that the internal systems issues will be dismantled or greatly disturbed, no action will be taken. Or just palliative activity will be tried. Whatever they decide, it’s out of your hands: you cannot help buyers manage these issues. And the fascinating thing is that they don’t even begin to understand how all of these elements operate together, or need to be resolved, until they start the process of searching for a solution to their Identified Problem. You assume that once they show up with their Identified Problem, they would have already managed these internal issues. But they haven’t. The reason for this conundrum isn’t so obvious, except within the world of systems thinking: all systems are balanced. No matter what is happening within a system, each element plays a role that maintains and creates its status quo. Once a decision is made to make a change – and bringing in any sort of fix is a change – the system gets frightened and behaves badly: systems don’t like disruption. If any part of the system acts impulsively rather than from within the unique laws of that system, the system can be harmed. Indeed, everything within the system is organized around maintaining stability. It’s called ‘homeostasis’. The whole (system) is greater than the sum of its parts. The system is more important than any one individual and will sacrifice the individual if challenged. When one part of the system shifts, the entire system shifts. Each system has a unique goal and modus operandi. Each system keeps itself in balance and will constantly self-correct in any way necessary to maintain this balance. Many of the rules within systems are implicit, and often translated uniquely by its members, making the system a living balancing act. Resistance comes from some part of the system that is threatened when being pushed into unfamiliar territory. When you introduce ‘change’ into this equation, individual parts will resist, messages will be miscommunicated, sabotaged, and misunderstood, and ultimately, the system will fight to maintain balance. When you first meet your prospects, they are in an early or mid-term stage of recognizing the systems elements that must be addressed in order to fix their problems. They can’t be any farther along than that or the problem would have already been resolved. When you first meet a prospect, you see a problem and wrongly assume that you can gather data, do a needs analysis, recognize possibilities for a solution (one that you could possibly offer), and then assume because they’ve got the problem and you’ve got the solution that they should make a purchasing decision. But they don’t. What you cannot see is their unique range of internal issues. You can’t fathom the way the parts of the system are fighting for balance, or resisting, or creating delays. You can’t fathom personality issues or fears, egos or job descriptions, vendor issues or initiatives. Sure, you hear about a small fraction of those things, and sometimes even understand a few of the issues (never all, certainly). Sometimes you even learn about how the buying decisions get made. But only Insiders can affect change. Note that a problem, or a need, doesn’t insure that the system will want to change, know how to change, be willing to go through what would be necessary to change, or take into account any particular needs when entering the change process. But our sales model consists of tools and techniques that solve problems and answer needs around an Identified Problem and product placement, causing the buyer to spend too much time, too early, in targeting what should be the last thing they do. Their first job is to figure out how to manage all of the internal pieces fighting for control, not caring that there is a problem. Until buyers do that, they won’t purchase your solution; focusing on the second phase of their decision process first slows them down. The sales model itself actually causes the length of the sales cycle, and limits the buyer to dealing with you around that part of the problem that is easily visible. You can create a much more important dialogue if you understand your job differently. Think about your job as a neutral navigator, or a servant-leader, or a Buying Facilitator. Think about your job as being the person who can work with the Inside person to actually lead the change, and your product as one of the cogs in the wheel. Not THE solution, but merely one of the pieces that will go in to the business problem resolution. Buying Facilitation is a systems-management model that approaches this first aspect of the decision process by using a very unique form of question – a Facilitative Question rather than conventional information gathering questions – to lead the buyer sequentially through generic aspects of the system that would need to consider change before being willing to adapt. This might include: leading them to decisions around how they will manage their current vendor, or work toward managing internal stakeholders who are being difficult. Once the buyer recognizes all of these unique systems aspects (which they will do eventually anyway and the time it takes them to do this is the length of the sales cycle) and is en route toward solutions – again, with the aid of the Buying Facilitator in designing solutions and actions – they will not only be able to buy the product much quicker but will automatically choose the Facilitator as their provider. No price objections. No confusion around which product is better. By using a sales model rather than a Buying Facilitation model, you are impeding the buyer’s decision process, elongating the sales cycle, making it difficult to differentiate yourself and causing price objections. Change your job and change your results. After all: do you want to sell? Or have someone buy? Trent R. Smock and his company, Straight-line Management Group, are experts in the area of sales, management and behavioral selling in the Financial Services arena, working specifically in the area of Variable Annuities. Straight-line Management Group’s focus is helping organizations differentiate themselves as sellers by helping buyers understand their own internal decision process, now incorporating Buying Facilitation® into their training offerings. www.smgmovie.com. 602.359.2685. XLNT Facilitation is a Swedish affiliate to Morgen Facilitations with extended experience selling enterprise solutions to the IT industry. Offering Buying Facilitation and Facilitating Buying Decisions training, as well as executive sales coaching and management, Ted Elvhage is a long-standing member of the MFI partner team. 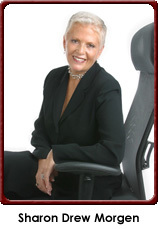 Sharon Drew offers individual coaching to senior executives seeking support in making major decisions around: set up of new sales groups and initiatives; sales management; hiring/firing of top sellers or sales management; designing sales initiatives; set up of telemarketing units; selling against competitors to ensure differentiation. As always, we’re here to serve you.